Hamburg: Rohwohlt Taschenbuch Verlag, 2004. This is the German edition of The Sinister Pig, published in 2004 by Rowohlt Taschenbuch Verlag in Hamburg and translated into German by Fried Eickhoff. 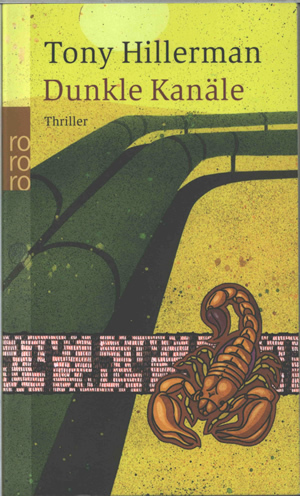 The front cover displays the author name, title, and "Thriller" on a speckled background shading from lime green to yellowish tan. The cover drawing features a double pipeline drawn in dark green, overlaid with a band resembling pink seed beads with stylized saguaro cacti in brown, and an orange-brown scorpion in the lower right corner. The publisher's logo is along the spine just above the center. The back cover background is lime green with brown and black printing and displays the publisher's logo in the same position, with praise for Tony Hillerman from the New York Times Book Review, a synopsis, praise from Publisher's Weekly, the publisher's Web site address, barcode and price. The author name, title, and publisher logo along with "23688" are printed bottom to top along the spine. Inside front and inside back covers are blank.